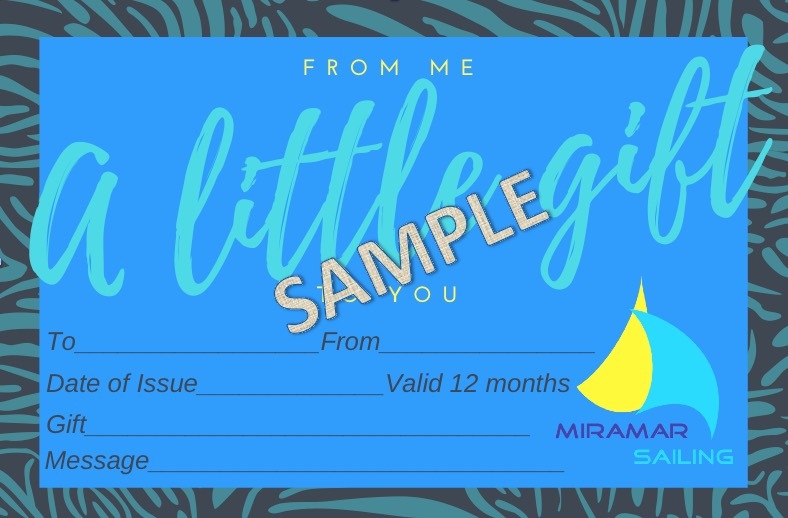 A Miramar Sailing Gift voucher is an ideal present for Christmas, a Birthday or any special occasion! Give a unique gift to a friend or loved one. If they love sailing (or want to learn!) then there is no better gift! Our gift vouchers can be designed for any value that you wish between $50.00 – $5000.00. The lucky recipient can then redeem the voucher towards a Miramar Sailing product of their choice. This could be a Miramar Sailing School course, a Caribbean Yacht Charter adventure, a relaxing Day Sail, or even taking part in an exciting Yacht Race in one of our International regions! There is something for all sailors from beginners to advanced. Our sailing vouchers are also a great last minute present as we will email you a personalised PDF copy of the voucher so you can give it on the same day. They are valid for 1 year from date of issue so there is plenty of time to take them. To buy your voucher, simply email or call us with your required amount, personal message and payment details.